Which CRM data will help you deliver a more personalised experience? Which CRM data will help you segment your data better? When these two filters are placed over your choice of data to bring into Eloqua, you will be set to make the smartest decisions and empower the marketing team to deliver a unique experience to your prospects, customers and partners. You will find it helpful to bring in a range of CRM ID’s e.g. Contact, Lead, Account and Opportunity ID’s. By using the various Contact Views within Eloqua, you will be able to see at a glance where a Contact fits into your data eco system. i.e. Is a Contact just in Eloqua or has it synched to the CRM? 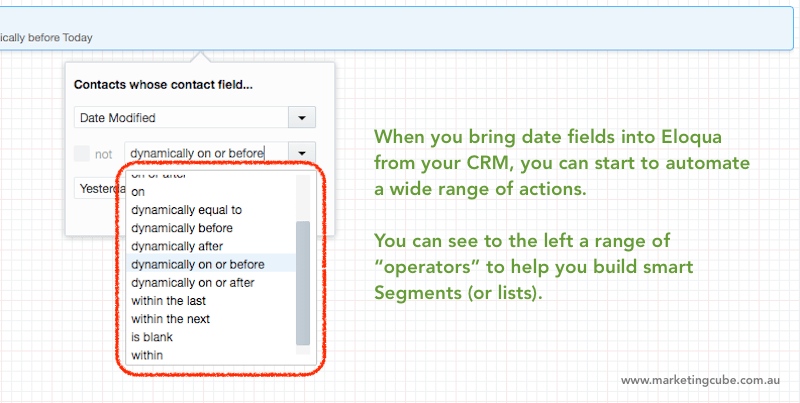 Remember, Eloqua does not have a Lead object like the CRM. If you want to email CRM Leads, you will need to build a Segment that includes Eloqua Contacts that DO NOT have a CRM Contact and Account ID BUT does have a CRM Lead ID. This will vary of course depending on what your organisation defines as a Lead. However, the above suggestion is a starting point. You want to make sure you bring through date fields as date fields and not simply text fields. Being able to create Segments in Eloqua based on the “last modified date” of a field can prove helpful for a range of Campaigns and specifically on the Campaign Canvas when you incorporate Shared Filters. This is a screen shot from the Eloqua Segment builder. As an example, you can see we’re dynamically asking Eloqua to return all Contacts with a “Date Modified” on X field as “dynamically on or before Yesterday”. Does I.T. need to get involved? If I.T. manage your CRM, then yes, they will need to get involved a little. Eloqua requires a CRM licence to complete the integration. Each time the integration runs, it will use it’s user access to login to the CRM to deliver data and to retrieve data. It’s highly likely you will determine some fields need to be added to the CRM as a result of the integration between the two platforms. One example is taking advantage of the email preferences capability native to Eloqua. Email preferences and/or subscription management is not a core function of most CRM’s. It’s best to ensure Eloqua is the source of truth of this information while exposing certain details to the CRM user community. To make the process easier and faster, Oracle Marketing Cloud Eloqua has out-of-the-box connectors/apps with the following CRM platforms. More are always being added.